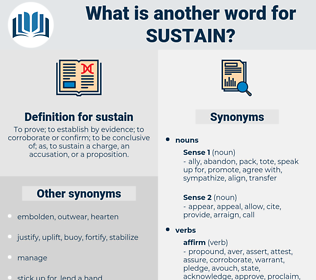 What is another word for sustain? To prove; to establish by evidence; to corroborate or confirm; to be conclusive of; as, to sustain a charge, an accusation, or a proposition. be in the grip of something. get someone's hopes up/build someone's hopes (up)/raise someone's hopes. Remained, Upheld, safeguards, Contributed, Defended, Argued, protected, Brought, backed. lay, underpin, withstand, substantiate, consolidate, endure, buttress, persist, stimulate, suffer, entertain, feed, stabilize, encourage, subsidize, guarantee, reinforce, defend, save, saving, bear, stand, obtain, assure, attain, absorb, achieve, tolerate, conduct, assume, solidify, stick, argue, resist, provide, boost, enforce, insure, restrain, generate, underlie, contain, prop, handle, afford, justify, undertake, satisfy, stabilise, detain, remain, establish, subsidise, confirm, defray, manage, affirm, sue, accompany, backstop. 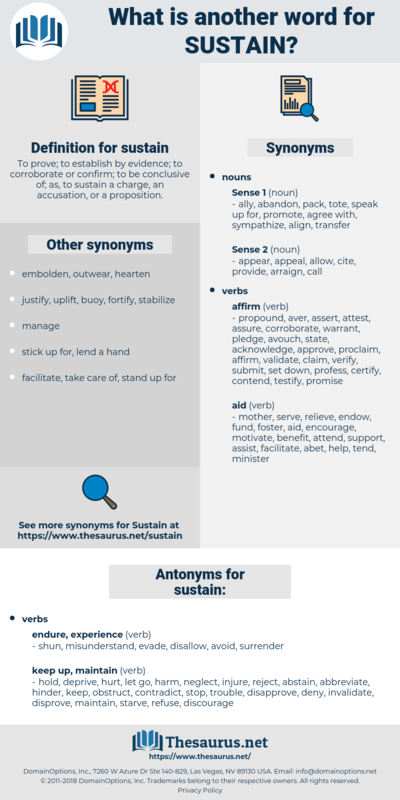 perpetuate, sustainable, survive, nourish, incur, retain, subsistence, assert, prolong, persevere, underwrite, undergo, engage, accommodate, preserve. shun, misunderstand, evade, disallow, avoid, surrender. hold, deprive, hurt, let go, harm, neglect, injure, reject, abstain, abbreviate, hinder, keep, obstruct, contradict, stop, trouble, disapprove, deny, invalidate, disprove, maintain, starve, refuse, discourage, disagree, weaken, halt, veto, ignore, shorten, take, condemn, discontinue, let down, oppose. repudiate, bypass, contest, fight, forbear, turn down, resist, fall under, dismiss, give up, spurn, elude, circumvent, dodge, drop, decline, shake off, escape, miss, throw down, refrain. Yes, I shall be free, rightly free, free to aid the country, and to got aid from the country, I shall be part of the country and can enjoy my will, because I will to be part of my country and to help build up her greatness and sustain and improve her institutions. While well aware, then, of our limitations, in this direction, it is fair to inquire if the Divine attributes, or any of them, appear to sustain our theory. keep on, retain, keep, continue. continue, uphold, bear on, carry on, preserve.